There comes a time in the life of most vehicles when it needs to be taken to a car dealership or repair shop so that its wheels can be realigned. This is essential not only because it makes the car easier and safer to drive (no more pulling off to one side), but also because it extends the life of the car’s tires and makes sure that they don’t become unnecessarily worn down by unaligned driving and the car’s tendency to veer either to the left or the right side. Getting a proper alignment done by a professional mechanic makes a vehicle easier to drive and allows it’s tires to last much longer. That’s a great combination, especially when the relatively low cost incurred at most repair shops is considered. There’s really no reason not to get it done at least once per year, or at least whenever the vehicle seems a bit more difficult to drive down the highway. Simply put, a wheel alignment (can be referred to as tracking or breaking) makes sure that a car’s wheels point the vehicle straight ahead, rather than to one side of the road or the other. If this sounds almost exceedingly simple and basic, that’s because it is. It is one of the most common repairs a vehicle requires but is often overlooked. It’s also one of the easiest and quickest jobs for a mechanic to complete. The primary and secondary alignment angles can be knocked out of their proper positioning by a number of factors, most of which are outside of the driver’s control. It most commonly happens when the vehicle comes in contact with a particularly large pothole at a reasonably high speed. These potholes cause quite a jolt inside the vehicle itself, but the rough ride experienced by passengers is only a fraction of the stress endured by the vehicle’s wheels themselves. The pothole can be so traumatic to the car’s wheels that it actually turns them slightly inwards or outwards. This causes the vehicle to veer to the right or left when the steering wheel is pointed straight ahead. Much rarer, but typically more severe causes of wheel misalignment are accidents and collisions. This might seem obvious, but even small accidents involving slight bumps/contact can push the steering off center. Over time, having to constantly jerk the steering wheel back and forth can take its toll on both the driver and the vehicle itself. Tires can become unevenly worn, and need to be replaced long before they would usually need to be. If a driver fails to spare the small expense of a wheel adjustment, they will often find themselves paying a much higher amount for new tires. Car owners should considerate any wheel alignment cost as a way to save money on new tires and car maintenance for the long term. Most of us do a good job of keeping up with necessary oil changes but often neglect taking care of alignment problems, which is harmful to any vehicle’s driving performance. Getting your wheels aligned is usually a very easy process and is much cheaper than replacing your tires. Some tire retailers offer rotations and alignments with a purchase of a new set of tires. Many shops run periodic specials or offer coupons to reduce the prices of alignment procedures. You may generally expect to pay $35 to $85 for a two-wheel (or front end) alignment. The prices for four-wheel alignments range from $45 to $105, sometimes more if warranties are provided. Costs may still vary depending on the shop and the equipment their staff use. Alignments are also considered as labor-only jobs so changes in local market conditions may dictate their price. Aligning the wheels of vans and other four-wheeled vehicles may cost more so it will be wise to inquire about pricing before leaving your car in the repair shop of your choice. Warranty offers may range from six month or 6,000 miles, or from one to three-year warranties. A three-year service warranty usually costs between $110 and $140. This is actually cost-effective, as wheels usually need an alignment once or twice a year. Some people have resorted to using the ‘Lifetime alignment’ offer which is can be purchased at most repair shops. This type of purchase is a once-off which enables you to bring your car in for an alignment anytime and it costs around $160. Considering that you’ll never have to pay again for your tires alignment, this is by far the best route to take. Your costs also depend on the particular shop doing the work and the equipment they use. Alignments are labor only jobs since you are not purchasing parts. Your local market conditions determine the cost of local labor. Ultimately it is important to remember that any wheel alignment cost you incur is actually an investment in the longevity of your tires and in improved gas mileage. As with virtually every type of maintenance performed on a vehicle, the price of a wheel alignment (specifically the labor involved) will vary based on the cost of living where the driver gets the procedure done. To minimize costs, some drivers actually prefer to align two wheels instead of all four. This is often possible if a vehicle has encountered a pothole on only one side of the vehicle and only the front and rear wheel on that side need to be realigned. The location of your residence or where you get the job done also impacts the wheel alignment price. The city where you stay on course matters and even the locality within the city plays an important part in deciding the cost of not just wheel alignment, but all other services. If you live in an area where the general cost of living is high, any kind of servicing of the vehicle will cost you more compared to low or moderate-income areas. At the same time, the charges also depend on the service station where you get the job done and the equipment that they use. The more highly advanced equipment used, the higher will be the cost. Costs can also vary on a vehicle make and model basis. Some mechanics charge more for larger or more expensive vehicles than they would for more compact and affordable models. Some auto repair station will try to sell you a warranty along with the service. However, this is not necessary and you can avoid such extra expenditure. Pay only for the labor cost and also make sure that when you are getting a two wheel alignment done, the service station does not charge you for a four wheel alignment. Get your vehicle assessed for the kind of tire alignment that is required. As with any vehicle repair or maintenance, drivers should seek an estimate from multiple mechanics. They should also pay attention to other special factors that might impact price, like coupons, promotions, and the mechanic’s overall reputation in the industry. What Causes Wheels to Become Misaligned? That are numerous factors that can have a vehicle’s wheels move out of alignment. To understand what leads to misalignment, it’s important to note that three different areas of measurement go into that alignment. Camber measures how far in or out a tire tilts in reference to straight up and down. In perfect alignment, the tire will stand straight up and down, with the top-center in the middle of the wheel. If a vehicle’s wheel bearings or ball joints are worn, the tire can start to tilt with regular driving and eventually come out of alignment. In the same way, camber refers to a wheel up-and-down alignment, the Toe refers to the front and back alignment. If the wheel is out of line, it will point more inward to either the front or back end instead of straightforward. A misaligned tire toe can be caused by worn tie rods or a bad steering box. An easy way to tell if the toe is the issue with excessive tire wear is if the steering wheel is misaligned. This is usually a result of a bad toe. 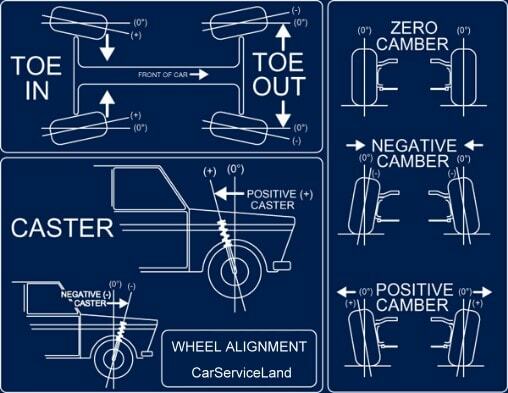 Finally, the Caster is the way the car steers itself when you aren’t holding the wheel. If you let go while driving and the vehicle begins drifting one direction or another, the wheel alignment is off. When correct, the vehicle should maintain a straight line at any speed. The caster is adjusted mechanically and not a part that is easily seen. Worn steering rods or bearings can lead to misalignment. You should look into having your wheel alignment adjusted or at least checked whenever you’re considering getting a new tire or set of tires. Beyond that, it is normally not necessary to get constant alignment tune-ups unless you start to realize one of the wheels may be a bit off. If your ride suddenly feels rougher or you experience some road hum, it may be a smart idea to get your alignment checked. Those things could be a sign that a tire is off alignment and getting a wheel alignment now will save you that greater cost in the future. How is a Wheel Alignment Conducted? When you bring your vehicle to a mechanic for an alignment they’ll check either two wheels or all four. All four are typically the best bet as there’s no use paying if you’ll only get half the peace of mind. The front two tires are checked and adjusted followed by the back two. The technician will park the car on a motorized treadmill-type machine that allows the wheels to roll freely while a computer measures how much they’re moving in several directions. This will show in what ways and to what degrees each tire is out of line. After this, the technician will remove the wheels and check for any worn parts. Since that’s the most common cause of bad wheel alignment any worn parts should be replaced before the proper alignment is given. Once the wheels are ready for aligning, they’ll likely be rotated to adjust for tire wear. The technician will mechanically adjust the camber, toe and caster rods and bearings to adjust for the misalignment. This ensures that when the wheel is remounted it is properly aligned. A typical wheel alignment cost is relatively low compared to most automobile work. Many tire shops give free lifetime alignment adjustments when you purchase a set of tires there. If you don’t have some form of deal you still won’t be paying much out of pocket. A typical mechanic will charge around twenty dollars per wheel. When tires are out of alignment, they wear their rims faster than expected. This reduces the mileage life you can expect from a set of tires. Uneven alignment also reduces your car’s fuel efficiency. Misalignment is not apparent to the naked eye, but your vehicle gives indications of a problem that you feel when driving. Prices for alignments are small compared to the savings you get from tire longevity and improved fuel economy. Excessive wear on the rims of tires is the key warning sign. The car may also pull to the right or left when you are driving and the steering wheel will not center. Finally, a problem with car alignment causes a shimmy or vibration that may be pronounced. Excessive tire wear and tracking problems with the steering are the primary symptoms of which to take note. Some experts say that a tire’s life could be a fraction of what it should be if the tires are improperly aligned. As we said before aligning an auto’s wheels consists of adjusting the wheels’ angles so that they remain parallel to each other and perpendicular to the road. Car dealerships often recommend having an alignment done every 10,000 miles or so. The goal of this procedure is to maintain the maximum effective life of your tires and assure your car tracks true on a level and straight road. Prices paid for alignment are offset by saving wear and tear on your vehicle. Your wheel technician will check the camber, which is the angle of the wheels. If the top of your tire is leaning out from the middle of the car, its camber is positive. If it leans in, the camber is negative. This wheel angle, when out of adjustment, will cause excessive wear on one side of the tire or the other. If it is too negative, the inside of the tire wears most. If it is too positive, the wear shows up on the outside of the tread. If this camber angle is different from one side of the auto to the other, the vehicle will have a pulling problem, drawing to the more positive side. On automobiles with front-wheel-drive, the camber cannot be adjusted. Problems occur when something is bent or worn, possibly from some kind of accident. It must be repaired or replaced. When a driver turns the steering wheel, the front wheels respond by turning on a small pivot which is attached to the vehicle’s suspension system. The angle of this turning pivot is known as the caster. If the pivot’s top leans toward the rear of the auto, it is positive. If the pivot’s top leans towards the front, it is negative. When the adjustment of the caster is off, you have trouble with straight line tracking when driving. If the caster differs from one side to the other, the car pulls toward the less positive caster side. If the caster is equal on both sides but too negative, the car will wander and the steering will feel light, making it difficult to drive in a straight line. If it is too positive, the steering is heavier and the steering wheel may jerk when you hit a bump. The caster also cannot be adjusted but must be repaired or replaced. The tow measurement of the wheels is the difference in the distance between the front of the tires and their backs. When the wheels are parallel to each other as they should be, the set is close to zero. When the fronts of the tires are closer together than the backs, the wheels toe-in. Toe-out is the exact opposite. Either of these causes tire wear. Unlike the camber and the caster, toe on the front tires is always adjustable. Sometimes it is also adjustable for the back wheels. Always test drive the car afterward to make sure the car alignment has been properly corrected. The need for wheel aligned is often confused with wheel balancing. Both appear as a problem with the handling of the vehicle and smoothness of the ride but are really not related. The main difference between wheel alignment and wheel balancing can be seen in the specific effects that the two normally cause. Wheels out of balance normally cause vibrations at highway speeds and the driver of the vehicle can feel this both in the steering wheel and in the seat vibrations. On the other hand, wheels that are not properly aligned will cause the tires to wear out much faster and will result in difficulties when steering the vehicle. If you are not sure if car alignment is needed, let go of the steering wheel for a second when driving to find out if the car pulls to the right or left. Tracking is off when the wheels are misaligned. Tire balance does not affect your ride this way. Most people don’t realize that maintaining a car in top working condition is necessary for the proper working of the vehicle. Usually, car owners think that the money spent in regular maintenance can be saved by a little making do now and then, but they don’t realize that this negligence can harm the vehicle and cost them much more in the long run. Important things like a regular oil change or brake service getting the wheels aligned on a regular basis etc are necessary for the upkeep of the vehicle. If these things are not kept in the proper state of repair, chances are that other parts of your vehicle like the engine will get affected and will cost you a lot more. However, most people think of the cost of oil change and wheel alignment and leave it for a later date. Wheel alignment cost is a small price to pay compared to the number of benefits it provides. Proper tire alignment ensures that the tires don’t wear out unevenly or earlier than they should and also ensures lower fuel consumption. This is a direct impact on your pocket as excess fuel consumption can be expensive just like changing the tires before time can prove to the expensive. At the same time, wheels that are not properly aligned can lead to loss of control over the vehicle which can result in an accident causing more damage to the vehicle and maybe even the driver and passengers. 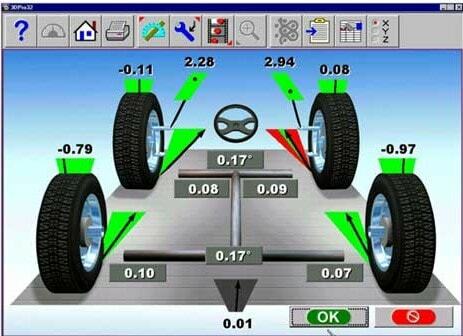 Wheel alignment cost depends on a number of factors which we will discuss here. Front end alignment, as one might imagine, concerns the alignment of the front axle of a vehicle. The end result of this process is to bring the tires not only parallel with each other but also to bring the tires perpendicular to the ground itself. This will leave the tires making even contact with the road on both sides, generally reducing the wear and tear on the tires themselves. There are many cases when a front end alignment may be required. A poor alignment, on the other hand, can lead to a number of technical issues that could cause excessive damage to breaks or tires and may require a greater future investment in repair work. Safety is also a key issue here, since driving a car with front end alignment problems can prove to be dangerous. Steering may become unstable, and there is a significant chance the driver could lose control of the vehicle especially during poor weather conditions. Front end alignment is a simple adjusting of the wheels. They are typically angled in one direction. They get bumped out of place with bumps and wear. This sets them back in place, where they should be. It saves the car’s longevity and maintains the safety of the passengers of the car as well. The average cost of a front wheel alignment tends to shift and change by reason, but a few numbers do tend to pop up repeatedly. At any given auto shop, the cost tends to run between thirty-five and eighty-five dollars, with prices both above and below that spectrum still common. Sometimes, after a period of continued usage, the angles on the wheels of your vehicles are bound to shift and become different from the initial angles that were set by the manufacturers of the vehicle. While the changes in the wheel angles may not immediately be clear to the naked eye by simply looking at the wheels of the car, these changes often make themselves felt through certain effects experienced while driving the car. For instance, they may manifest in the form of difficulties in the steering of the vehicle as well as accelerated wear of particular parts of the vehicle’s tires. This is a problem that needs to be corrected just as soon as it is observed and there are a number of corrective interventions which are designed to do so. These corrective interventions are collectively referred to as tire alignment or wheel tracking and 4-wheel alignment is one of the best of these interventions. Many people do not really understand what wheel alignment in general and 4-wheel alignment, in particular, are really about. In fact, 4 wheel alignment can be divided broadly into two categories. In the first type of alignment, even though all the wheels are checked, including the rear toe and tracking, not all the wheels are adjusted. Only the front wheels of the vehicle get the adjustments. In the second type of 4 wheel adjustment, all the wheels are adjusted. The rear alignment gets adjusted first and then the front alignment gets adjusted. It is evident that the latter type of 4 wheel adjustment involves a lot more work compared to the former and as such, it also costs relatively a lot more money to perform. In general, a good 4 wheel alignment should begin first with a test drive. This gives an indication of where the alignment problems lie. Upon completing the alignment, the car should be taken for another test drive in order to establish whether or not the problem has been fixed. In addition, all of the tires must be in good shape before 4-tire alignment can be performed, otherwise, some parts of the tires will only be making partial contact with the ground after the alignment is done. There are typically three different types of places where a customer can get reputable service from a professional mechanic. The first place, and generally the most popular among most consumers, is the car dealership where the car was initially purchased. These car dealerships typically have special deals on maintenance for people who drive their make and model of vehicle and they usually have preferred customer discounts to help mitigate the cost of the job. Tire shops also typically provide alignment services for a fair price, and they can check for any impact the misaligned wheels might have had on tires since the incident occurred. That can really give peace of mind to some consumers, and these shops should be considered a great source of both service and information when seeking an alignment or balancing procedure. Finally, traditional mechanics are usually the best option to consider when shopping around for great service and even better pricing. Independent mechanics are often able to compete more nimbly on price and scheduling, allowing the job to be completed in a much more expedient way without sacrificing the overall quality of the wheel adjustment itself. No matter which option you choose, you should be aware that the procedure’s cost will be relatively affordable when compared to more extensive vehicle maintenance options. With prices that often come in under $100 total, a wheel alignment is a great way to maintain the integrity of a car’s tires while keeping it easy and safe to drive. With good attention to a mechanic’s pricing, reputation, and procedures, the job can be done quickly and at a high quality at either a car dealer, tire shop or independent mechanic. As you can see, the process of getting wheel alignment coupons is easy. On the other hand, the benefits are many. However, before you sign up for any coupon, be sure to read all the terms and conditions. Auto Mechanics advice that tire alignment should be done at least twice in a year or after you have traveled 6000 miles. In addition, anytime you want to go on a long journey, it is advisable that you confirm that your car wheels are well aligned. For a two-wheel procedure, drivers can expect to pay anywhere between $35 to $85, based on their location and the type of vehicle they own. Prices go up if drivers choose to get all four of their vehicle’s wheels aligned. This can cost anywhere from $45 at the low end to $105 in more expensive areas. When wheels are being aligned by a mechanic, many car dealerships and repair shops will also offer to balance a vehicle’s tires. Balancing is a relatively inexpensive task to complete, and it will typically add around $12 per wheel to the overall price of the alignment procedure. Given its benefits to vehicle integrity and safety, most drivers pursue wheel balancing as well. While prices vary on alignments, there are still ways to save money while getting this very important bit of maintenance done. One of the most common methods is to couple the service with another. You might have work done on the rear end of your car and have the wheel alignment on both ends done for a lesser price. Many companies also include a vast discount, up to the entire cost of the alignment, for those that buy tires on site. Be careful of these deals, though, as the cost of the alignment is often simply included in the cost of the tires themselves. There are also often wheel alignment coupons available from many auto shops to have this procedure done, usually as a way of getting customers into the shop to take care of other types of basic maintenance. Having the front end of a vehicle aligned is quick, easy and important if you want to get the most out of an expensive set of tires. It can help the vehicle to drive better and handle more evenly, and the costs are quite minimal compared to some of the other forms of maintenance that many have done. If you are willing to spend an amount of money equal to a single oil change when your tires are out of alignment, you may be able to put off buying new tires for several years. In comparison to tire cost, wheel alignment cost is actually quite inexpensive.